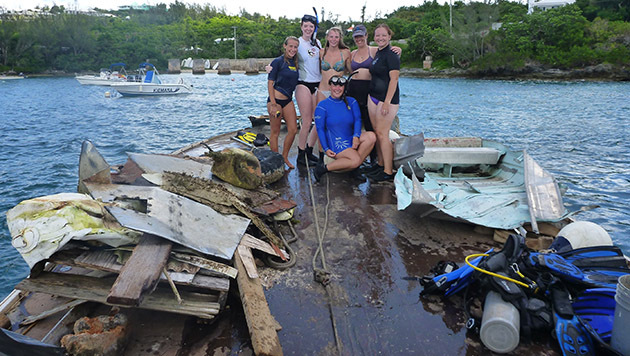 BIOS educator Kyla Smith (pictured in hat) and BIOS adjunct faculty member Philippe Rouja (not pictured) lead a BIOS team, made up of students from Roger Williams University and the University of Rhode Island, during an island-wide cleanup effort in September 2016. Photo credit: Philippe Rouja. Keep Bermuda Beautiful's (KBB's) mission is to engage individuals to take greater responsibility in reducing waste and eliminating litter through action and education. BIOS has partnered with KBB since 2009, coordinating faculty and staff volunteers for cleanup efforts and leading cleanup projects in the East End. For more information on KBB please visit their website.